Chicory is a cousin to the dandelion plant, and both the roots and the flowers are used for a variety of medicinal and edible reasons. If you use roasted chicory for any reason and have recently discovered you are expecting a baby, it might be wise to discontinue its use until after your little one is born. Learn more about the effects chicory can have for you and your unborn baby, and speak with your doctor to make the smartest and safest decision for you. 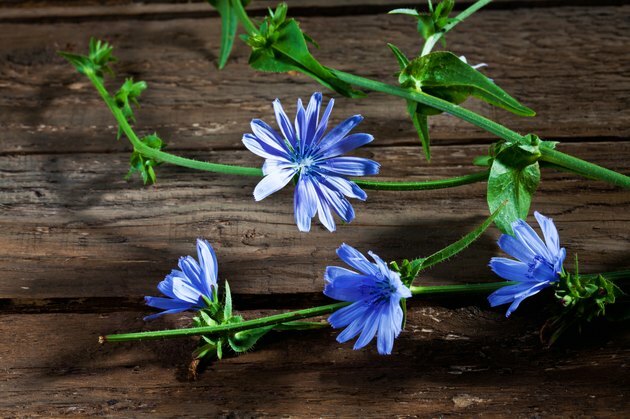 Chicory plants have been growing in the United States since the 19th century but have been used by ancient civilizations for thousands of years. The plant grows as a weed on roadsides throughout the country and develops bright blue flowers, which bloom between July and September. Matthew Wood notes in his book "The Earthwise Herbal: A Complete Guide to Old World Medicinal Plants" that the bitter nature of the chicory plant is what gives it medicinal strength, but it also is what turns certain people off from its taste. The primary part of the chicory plant that is used is the root, which often is ground into powder for medicine and supplement purposes. The chicory plant might be used for promoting a health gastrointestinal system and help treat intestinal problems, such as constipation and diarrhea. The plant also might be used as a treatment for cancer and heart disease. Chicory leaves are used like other leafy greens as a nutritious addition to a tossed salad. Chicory also can be roasted and ground into a substance similar to coffee grounds that also can be consumed in place of coffee. Your doctor has likely recommended that you do not consume too much caffeine during pregnancy because it can have negative effects on your unborn baby's health. Roasted chicory is an alternative to coffee because it does not contain caffeine, but it might be safer to opt for decaffeinated coffee. Chicory has certain documented effects that might impact the health and safety of your pregnancy. Drugs.com recommends that you avoid chicory use of any kind while expecting. Chicory has been shown to have harmful effects on a pregnancy. The plant is both an emmenagogue and an abortifacient. An emmenagogue is a substance that promotes menstrual bleeding, which might lead to a miscarriage. An abortifacient is a substance that has been shown to cause a miscarriage. If you come into contact with chicory, you also might develop contact dermatitis, a rash that develops in response to certain substances. What Are the Benefits of Guarana?